The Pound is opening marginally higher this morning as the bulls continue their Friday’s optimism into this new week. On Friday, the UK retail sales rose unexpectedly strongly by 1.0% over the month in January after falling sharply in December. The core UK retail sales rose 1.2% MoM in January. In political news, top-level Brexit negotiations between the UK and the EU will resume this week as UK Prime Minister Theresa May prepares to return to Brussels to gain concessions on her withdrawal deal. Looking ahead, traders will stay on alert of any new possible Brexit headline throughout the day, as there are no economic data coming out from the UK today. 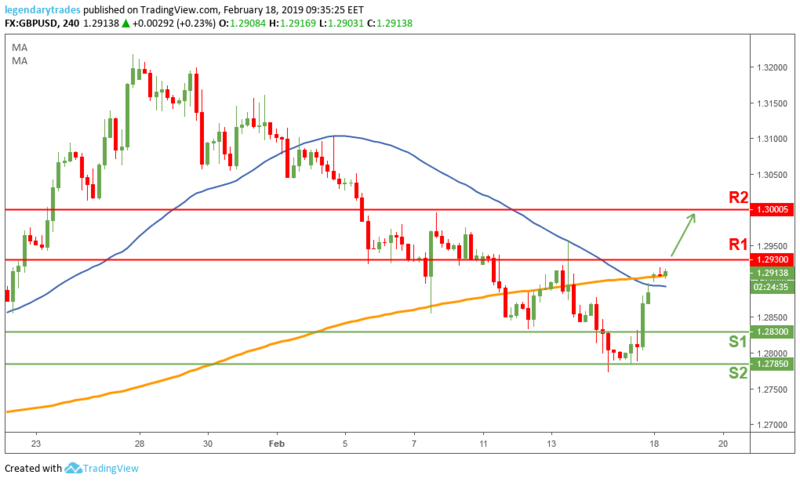 The Pound keeps breaking above key technical levels as it crossed above a key resistance level 1.2830 (which turned to support) and the 50/200-day moving averages. The greenback declined to a 5-day low of 1.2920 against the pound and is currently trading just below the 1.2930 (R1). A break above this level might take the Sterling to retest the key resistance level at 1.30 (R2).